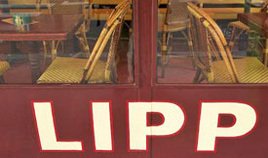 Brasserie LIPP was founded in 1880 by Léonard LIPP. The Brasserie has over the years become the meeting place for writers, painters and also political and journalistic figures in Paris. Tradition and character in the heart of Saint-Germain des Près. A typical French brasserie styled cuisine. Certainly one of the most typical Parisian Brasseries set in the heart of Saint Germain des Pres area. A nice place for a dinner when looking for the soul of Paris. For a perfect evening - A nice thing to do : take a glass of wine (or a cafe) at Les deux Magots cafe on the Saint Germain Boulevard before enjoying a dinner at the Lipp Brasserie. From the world over, people come to wallow in the unique atmosphere of this brasserie where people-watching is a timeless pastime. The Coupole brasserie is a nice place to eat in Paris : Book your dinner at la coupole. The Paris Restaurants Guide is an excellent ressource to find and book online Restaurants in Paris. Currently featuring several hundred restaurants in Paris, including all the top restaurants but also the famous Paris Brasseries and Bistros, it is the definitive online guide that offers free online reviews and booking facilities... Just like in the theatre, a red velvet curtain in the brasserie entrance is drawn back to reveal a scene of different kind, one where an usher, dressed in sober attire, takes your coat and guides you to your table to present the culinary program. See our selected brasseries in Paris.